Fig. 3.1. Crop model estimates of rice yield changes for different levels of warming for (a) China and (b) India, as reported in various studies. Black dots indicate effects without CO2 fertilization, and grey dots with CO2 fertilization, with arrows connecting points from the same study. The only difference between points connected by arrows is thus the simulated effect of CO2. Values were derived from three studies for China (Matthews et al., 1995; Lin et al., 2005; Tao et al., 2008), and five for India (Matthews et al., 1995; Lal et al., 1998; Saseendran et al., 2000; Aggarwal and Mall, 2002; Krishnan et al., 2007). climate models agree that rainfall will increase are high-latitude regions where rainfall does not generally pose a severe limit to crop growth. Many tropical and subtropical regions that experience frequent drought stress are instead expected to see reduced rainfall, such as southern Africa, much of Mexico and south-west USA, southern Europe and Australia. In most locations, the direction of precipitation change over the next few decades is ambiguous, with some climate models showing more rainfall and others projecting less. However, in many places, even when rainfall is projected to increase it is often by an amount that will be insufficient to outweigh the negative effects of warming. Hence, the effects of warming still dominate both the projected yield impacts and the associated uncertainties (Lobell and Burke, 2008). A third critical factor affecting crop yield is atmospheric CO2, which, like temperature, is rising to unprecedented levels. Many experiments with higher CO2 have been performed in greenhouses or open-top chambers in the field, showing a significant enhancement of crop yields. This enhance ment is considered in most models, and often results in net positive changes in yields up to several degrees warming (see Fig. 3.1). However, only a few studies have been conducted under realistic field conditions using free-air CO2 enrichment (FACE) experiments. These latter studies have tended to show lower yield responses than the previous studies (Table 3.1), giving rise to considerable debate on the expected benefit of CO2 for yields. Table 3.1. Mean estimates of yield increases (%) for doubled CO2 from enclosure (chamber) and FACE studies (adapted from Long et al., 2006). a Only a single FACE study has measured yield for a C4 crop as of 2008 (maize in Illinois in 2004). photosynthesis effect appears to only matter for C3 crops such as wheat and rice, because intercellular CO2 levels in C4 crops like maize are insensitive to ambient atmospheric levels (Leakey et al., 2006). The transpiration effect operates in both C3 and C4 crops, but the magnitude of the response depends greatly on soil moisture levels. It is therefore difficult to extrapolate values from a small number of experiments. Indeed, much of the disparity between enclosure and FACE results may be due to the fact that chambers tend to limit root growth and raise canopy temperatures, both of which can elevate water stress relative to normal field conditions (Leakey, 2009). Nearly all FACE experiments have been performed in temperate conditions, so less is known about CO2 effects in tropical regions. Maize responses in the FACE experiments conducted in Illinois, for instance, may be smaller than responses expected in more drought-prone regions. More experimentation and model validation in tropical conditions is therefore an important need for improving understanding of CO2 response. Most models used to assess future impacts include some representation, albeit imperfect, of the effects of changes in average temperature, precipitation and CO2 on yields. Those that do not are at least explicit about the absence of these commonly treated factors. Yet many other processes are rarely included in models but could potentially have significant effects on yields in certain situations. These include effects of pest and disease responses to climate change, brief exposures of crops to very high temperatures (e.g. > 40°C), elevated ozone (O3) (which is expected from higher temperatures as well as greater pollution levels, especially in China), more frequent flooding and potential loss of irrigation water because of regional hydrological changes such as alpine glacier melting. Though these are areas of active research, quantitative understanding of their potential roles is only beginning to emerge. Therefore the assessment results presented in 'The Food Economy in a New Climate' section should be viewed in the light of these unknowns. One factor of particular concern to agriculture would be an increase in inter-annual climate variability. In most regions there is little agreement among climate models on whether temperature variability will go up or down or remain the same (Raisanen, 2002). In some areas summer temperature variability is projected to increase because of a reduction in soil moisture, which removes an important dampener of temperature volatility. However, it should be noted that all climate models used in these assessments do not include a representation of irrigation, which should prevent large moisture changes in many major food producing regions, so that the climate effects of projected drying may be overstated (Lobell et al., 2006). Precipitation variability is projected to increase in more locations and models than temperature, but disagreement between models is still quite large (Raisanen, 2002). 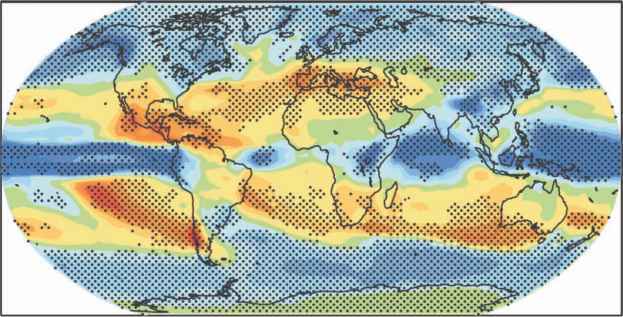 Some models suggest changes in important modes of variability, such as monsoons and El Niño, so there appears at least the potential for significant changes in variability (Meehl et al., 2007). At present, however, there is wide disagreement among models, and the ability of most models to reproduce current modes of variability is dubious. The fourth assessment report of the Intergovernmental Panel on Climate Change (IPCC) concluded, for example, that 'there is no consistent indication at this time of discernible future changes in ENSO [El Niño-Southern Oscillation] amplitude or frequency' (Meehl et al., 2007). This is obviously an important area of active research, but to date there is no compelling reason to believe that increased variability and resulting effects on agriculture will approach the effects of mean changes. For example projected increases in temperature and precipitation extremes, which are robust across models (Tebaldi et al., 2006), are driven much more by projected increases in average temperatures than by changes in inter-annual variability, even in models with increased variability (Raisanen, 2002).